Swedish bookie popular in Scandinavia, Belgium and the Netherlands. Unibet offer one of the best free live streaming services for iPhone and Android. 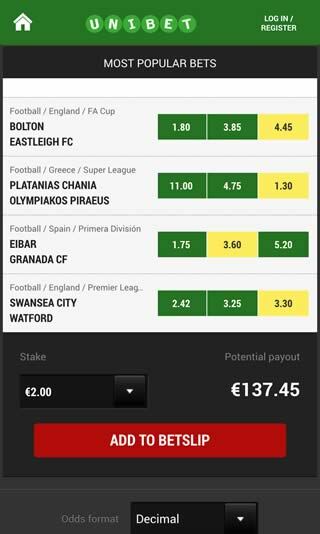 Bet in-play on Spanish La Liga, German Bundesliga, the EPL and more. If your first Android or iOS bet loses, Unibet will refund you up to £20. Fully functional sports betting apps for the Apple Watch smartwatch. Unibet is a Swedish online sportsbook that is very popular in Scandinavian countries like Finland and Denmark as well as Holland, Belgium and Australia. As a result the app puts a lot of focus on soccer leagues and other sports from continental Europe. 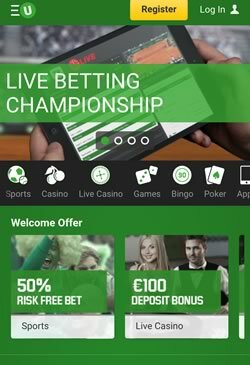 A native Unibet bookmaker app is available for both the iOS and Android operating systems. Unibet offers some of the best betting odds in the industry, particularly for European sports. The interface is really simple and allows you to check a full list of the events offered live and the markets available. It also shows real-time score, with a variety of useful stats to help you make an informed bet. 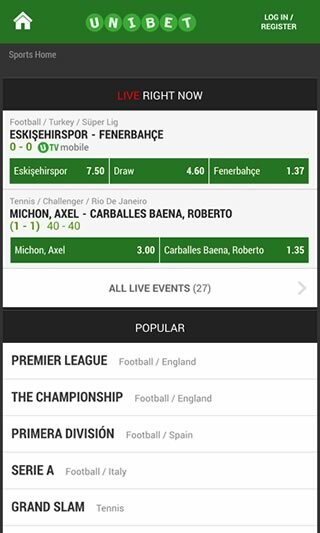 If you download the Unibet sports betting app you will also be able to watch live sports from around the world on your phone. Live streams are available for major tennis tournaments, NBA basketball, Latin American soccer and European football leagues from Italy, Spain, Germany, Austria, Switzerland and more. In order to be eligible for this feature, you need to have a Unibet account and place a bet on the event you would like to watch. The option to settle your bets before an event has concluded is one of the most popular new features in the sports betting world. With Unibet Cash-In you can cut your losses or collect winnings if you feel things might not go your way. Unfortunately, this option is limited to single live bets only. If your wager is eligible for Ca$h-In, a red button will appear on the drop-down underneath. Just click and accept. 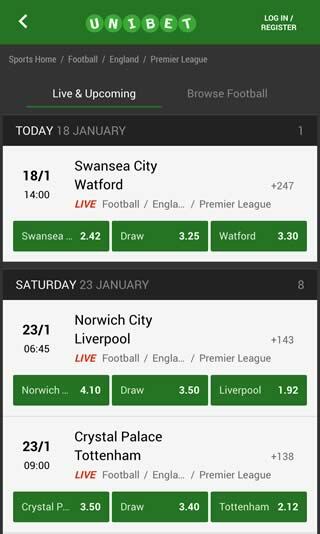 Unibet are a global sportsbook so pretty much every football league is covered, including the English Premier League, La Liga, the Bundesliga, Seria A, and all UEFA and FIFA competitions. Betting lines on all American leagues such as NBA, NFL, NHL, MLB, and MLS are also available. You can also find rugby, horse racing, greyhounds, volleyball, darts, snooker, Australian Rules and many more. All the traditional markets are covered, but there is also a bunch of side and prop bets available. The min bet in Unibet is £0.10 and the maximum depends on the event. Unibet have developed a native sports betting apps for both iOS and Android phones. 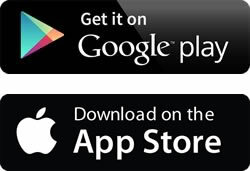 The iPhone/iPad version is available to download from the iTunes App Store, while Andorid user can install the Unibet apk file directly from their website. 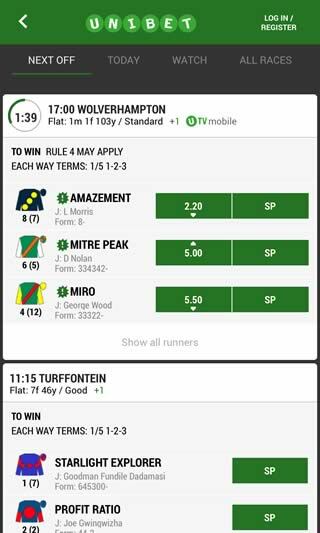 If you own a Microsoft Lumia device running Windows Phone then there is a browser-based Unibet app that will work on any smartphone. In our opinion, Unibet have developed the best bookmaker software for the Apple Watch. The Apple Watch offers in-play betting, odds, notifications and scores on football and horse racing. A gambling app for Android smartwatches is in development. There are lots of cool promotions that Unibet offers to its customers. The first deposit bonus is 50% of your first bet for up to €15. The lowest qualifying wager is €10 and the offer applies to both pre-match and in-play bets. There is a 10 times rollover requirement prior to withdrawal. Unibet has lots of other specials like a cash back for football, live offers and other.